Today is Thursday the 3rd of January 2019 and as such it is the 14th day of me trying to write in this blog during my Christmas Holidays. There has not been much writing, has there? No sirree, there has not. Swedish Julbord dinner on Christmas Eve. Traditional Irish Turkey and ham dinner Christmas Day. Visitors came, mostly my siblings, for a few days before New Year. Yummy Indian Takeaway at home on New Year's Eve, followed by my own tradition, ie, Spin In the New Year. I hosted a New Year's Eve Virtual Spin -In thread in both the UK Spinners and Irish Spinners groups on Ravelry. It is a great feeling to spin at home and share photos and chat with other spinners across Ireland and UK. Now I am taking part in a new thread on Ravelry: Spin 10 minutes a day. Little odd bits of unfinished spinning projects are duly being completed chez moi. And DD#2 has managed to find a house to rent in Galway for her work placement starting next week and get a car loan approved, with some help from me. Tomorrow we go to view a car, fingers crossed. Next Monday, it is back to work for me, back to school for my younger kids. Husband went back to work yesterday. All back to normal. For now, I am going to spin some more and then get a good night's sleep. I hope you all enjoy these last few days before work and school start again properly next week. 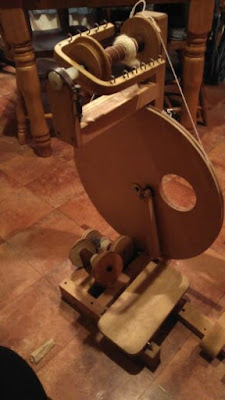 PS: Last July I published a post with photos of old Irish spinning wheel types in it. Sadly, I have since deleted the post, without realising that I had a comment pending on the post. Apologies about that, especially to the commenter, I will try to address the topic again at a later date, and contact the commenter directly to answer the comment. 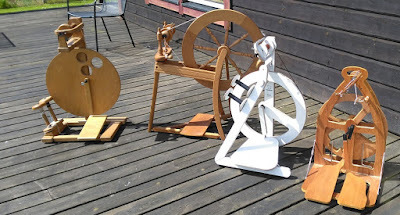 If your interest is in spinning or weaving you can search for excerpts about spinning and weaving etc, and you can also search the Photographs section for photos of spinning wheels and weaving. An old unmarked Louet S10 wheel from Holland. Purchased from a seller on marktplaats.nl. I live in the Irish countryside. I love walking and looking at the sky overhead. I also love spinning! IMF you have any questions about spinning or any comments about my blog, just let me know by leaving a comment. Thanks. In Autumn 1994, I took my first spinning lesson. It was a weekend course, in West Co Limerick. We learned to spin on a drop spindle, and to spin on a wheel. There is a photo of me spinning on a Louet-type wheel in the kitchen of the draughty farmhouse we lived in that year. 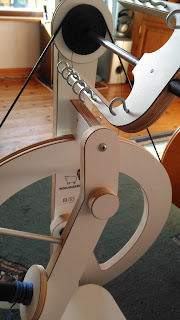 This photo reminds me that I rented a spinning wheel from the spinning teacher, Julie, for a month or two. The winter got colder and so did the kitchen, and I was expecting my first child and so the wheel was returned to Julie and my drop spindle got packed away in a box. Roll on 16 years, and 4 children later. I had some time off work for health reasons. The Internet had arrived. I discovered blogs, and blogs about knitting, and then Ravelry, and then spinners! little bottle of sewing machine oil, with long nozzle. Take off the bobbin from the flyer and put a drop of sewing machine oil onto the metal axle of the flyer. The flyer is the U-shaped piece with hooks. Those interested in Irish folklore and old photographs can visit this website www.duchas.ie, where the National Folklore Collection has been digitised and is free to view to all users. The Schools’ Collection Approximately 740,000 pages (288,000 pages in the pupils’ original exercise books; 451,000 pages in bound volumes) of folklore and local tradition were compiled by pupils from 5,000 primary schools in the Irish Free State between 1937 and 1939.